Box Office Predictions: Vishwaroop 2 [Hindi] is set for release this Friday. 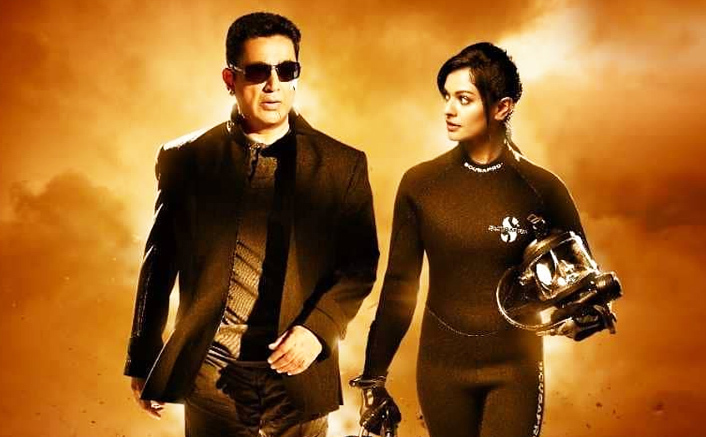 Film is a sequel to Vishwaroop and Kamal Haasan had announced back then itself that the second instalment was always on the cards. Not that the Hindi version had done too well but then down South the Tamil version had still done much better business. Moreover, Kamal Haasan was quite passionate about continuing with the story and even though it has taken many years for the sequel to finally release, the fact that this is indeed happening is good enough. For the producer/director/actor, what goes on favour is the fact that this is a solo release for him this Friday. There is no competition from any other film and hence all attention would be for Vishwaroop 2. That said, one has to take this too with a pinch of salt since the film’s run would be curtailed by the arrival of two Bollywood biggies this Wednesday itself, Gold and Satyameva Jayate. It would have to be seen that how many screens are retained by Vishwaroop 2 from Wednesday onwards and for that the espionage thriller would need to be really solid so that exhibitors show confidence in it. Box Office Update: Mulk Is Audience’s First Choice, Karwaan Hangs On, Fanney Khan Rejected! Filmy Hype Meter: John Abraham’s Satyameva Jayate On The Box-Office Prediction Scale! As for the opening number, one isn’t expecting any fireworks. Back then when Vishwaroop had released, its Hindi version had collected less than 2 crores on its opening day. One isn’t expecting anything remarkably different from the sequel either as the Hindi version may only open in 2-3 crores range. Given the kind of budget that the biggie carries, the film would need to jump exponentially in days to follow so as to sail through. The post Box Office Predictions Of Kamal Haasan’s Vishwaroop 2 (Hindi) appeared first on Koimoi. Box Office Predictions: Can Befikre Take A Double Digit Opening Tomorrow?